Scheme 7 Dehydrative glycosylations via glycosyl arylsulfonates [20-23]. 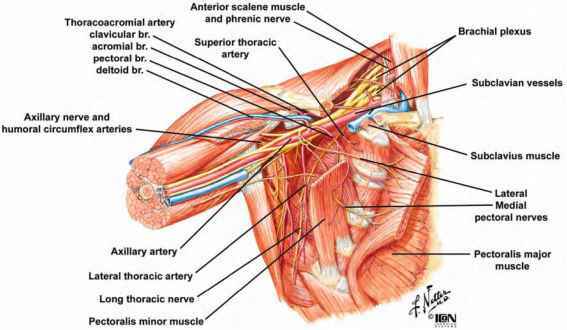 * Coupling performed in the presence of 2.5 equiv AcNMe2. activated to form the corresponding oxophosphonium species, which can then be displaced (SN2) by a variety of weak-acid nucleophiles, including carboxylic acids, phenols, V-hydroxyimides, imides, and oximes. 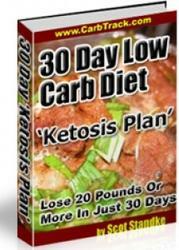 The process, being a one-pot dehydration, was therefore studied in the context of activation of the carbohydrate C1-hemiacetal function. Early reports by Jurczak et al. 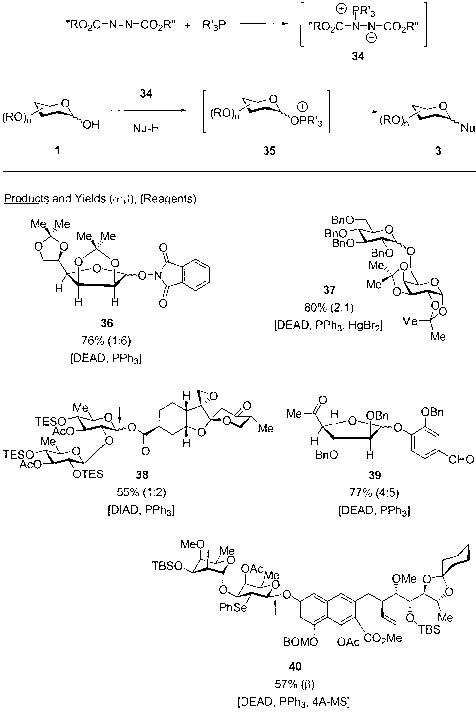 focused on the preparation of V-glycosylphthalimides from various furanoses and pyranoses employing diethyl azodicarboxylate, triphenylphosphine, and phthalimide as glycosyl acceptor; however, yields were typically low (5-43%). The use of V-hydroxyphthalimide as the glycosyl acceptor, on the other hand, led to a dramatic increase in coupling efficiency (e.g., 36)  with both pyranose and furanose donors. The utility of this particular glycosylation was demonstrated in the preparation of a key alkoxyamino glycosyl linker in Nicolaou's synthesis of the oligosaccharide portion of calicheamicin y . Scheme 8 Dehydrative glycosylations via glycosyl arylsulfonates . Simple alkyl alcohols are typically poor acceptor substrates for this type of coupling owing to the insufficient acidity of the acceptor component to aid in the formation of the phosphonium salt 34. To overcome this difficulty, Szarek and coworkers  introduced a mercuric halide salt to facilitate the formation of 34, thereby effecting dehydrative glycosylation of alcohol acceptors (e.g., 37) with hemiacetal donors. Carboxylic acids are generally good nucleophiles in the Mitsunobu reaction and have also been demonstrated to function as efficient glycosyl acceptors with this protocol. Smith has refined and used this method for glycosyl ester formation  as one of the key convergent steps (i.e., 38) in the synthesis of a ( + )-phyllanthoside . Likewise, phenolic nucleophiles have also been shown to be useful acceptors. 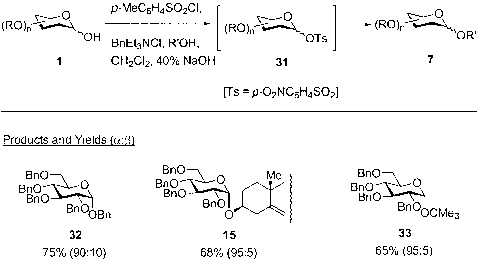 Early reports involved efficient glycosylations to prepare simple phenyl glycosides  followed by the preparation of more complex ones such as 39 , an intermediate in Ogawa's total of synthesis of hygromycin A . Roush's preparation of the olivomycin fragment 40 , highlighting the utility of the method in complex molecule synthesis and its tolerance to a wide variety of sensitive functionalities, is of particular interest. Mukaiyama and coworkers have developed an alternate method for the generation of glycosyl oxophosphonium intermediates. This method is based on Hen-drickson's earlier work concerning the development of phosphonium anhydride dehydrating reagents, prepared by the reaction of triphenylphosphine oxide (2 equiv) and triflic anhydride (1 equiv) . 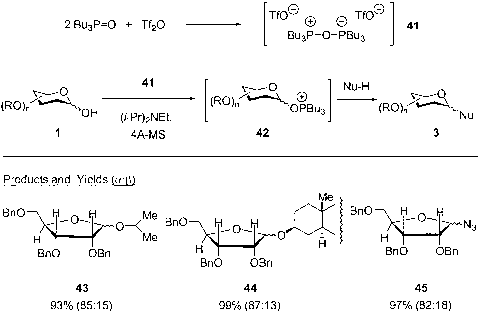 With the reagent combination of tributyl phos-phine oxide (2 equiv) and triflic anhydride (1 equiv), Mukaiyama reported that the resulting diphosphonium salt 41 (Scheme 10)  efficiently converted the hemiacetal functionality of 1-hydroxy carbohydrates to the anomeric oxophosphonium species 42, an effective glycosylating agent. 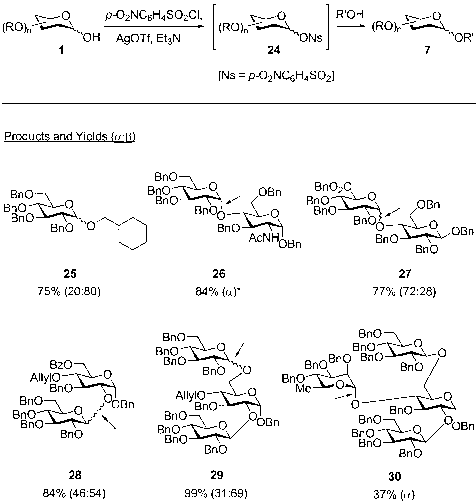 In the presence of i-Pr2NEt as an acid scavenger, glycosylation of a number of simple alcohols, O-TMS-protected alcohol acceptors, and even azide acceptors, can be effected with 2,3,5-tri-O-benzyl-d-fura-nose to afford the product glycosides (e.g., 43-45). Scheme 9 Dehydrative glycosylations via glycosyl oxophosphonium intermediates [26— 37]. DEAD = diethyl azodicarboxylate; DIAD = diisopropyl azodicarboxylate. Scheme 10 Dehydrative glycosylations via glycosyl oxophosphonium intermediates .